coast | We Have Twins?! 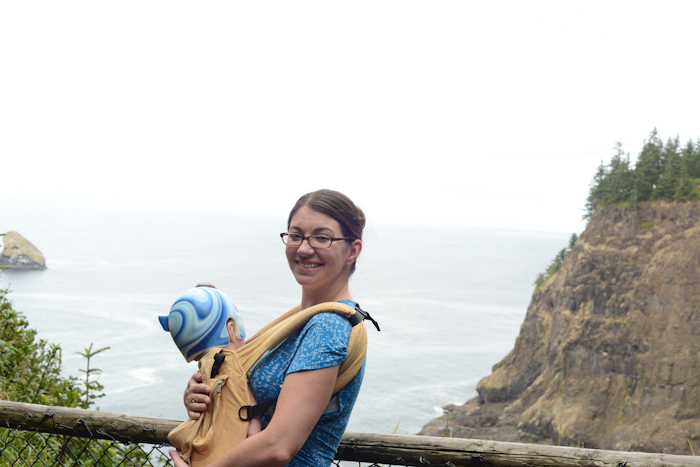 Our summer coast adventure this summer was to Astoria! 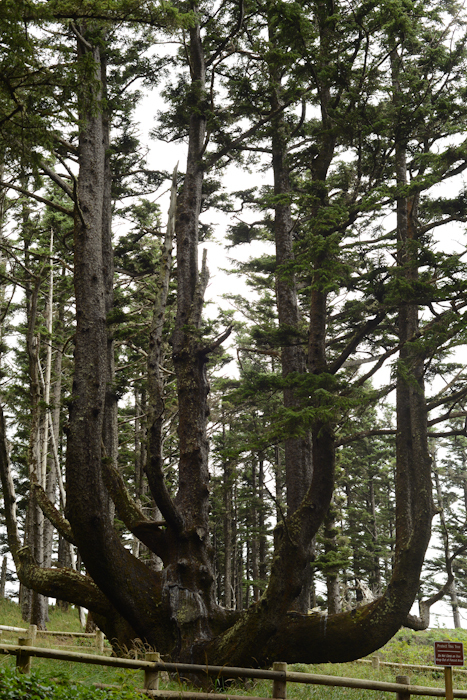 We hadn’t been there before, so it was fun to explore a new place. We went on Labor Day for two nights, so there weren’t too many people aorund. Unfortunately, it was also when that horrible Eagle Creek fire started, and the smoke followed us all the way out to the coast. Our first stop was actually past Astoria at Fort Stevens the famous beach with a real life shipwreck (the Peter Iredale). The boys had a blast playing in the water, climbing the ship, and playing in the sand. We stayed at the Hampton Inn, of course, which is my favorite hotel because it always has a reliable good free breakfast, and usually a pool. We brought the boys’ floaties and they loved going swimming! They were so cute–flapping so hard around the pool, puffing out their cheeks to hold their breath. But perhaps even better than being cute, the swimming totally wore out the boys and they went to sleep really fast and easily. Usually vacation bedtime is *terrible* so this was a very welcome surprise. 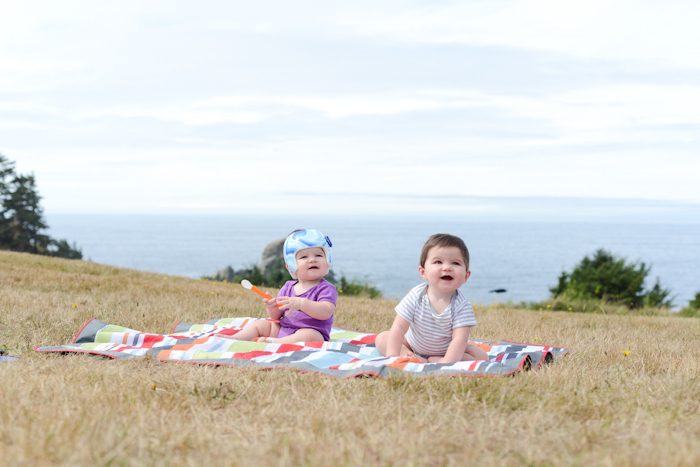 They shared a big bed–this was our first time traveling without a pack n play or a kid tent. What an exciting move up, to not need special places/equipment for them to sleep! On Day Three, we visited the Astoria Column! The boys walked all the way to the top with us, all 165 steps! And then about thirty seconds later they were like, okay let’s go back down. We also found this huge playground called Tapiola Park, and the boys had a fantastic time running around playing on day two and three. 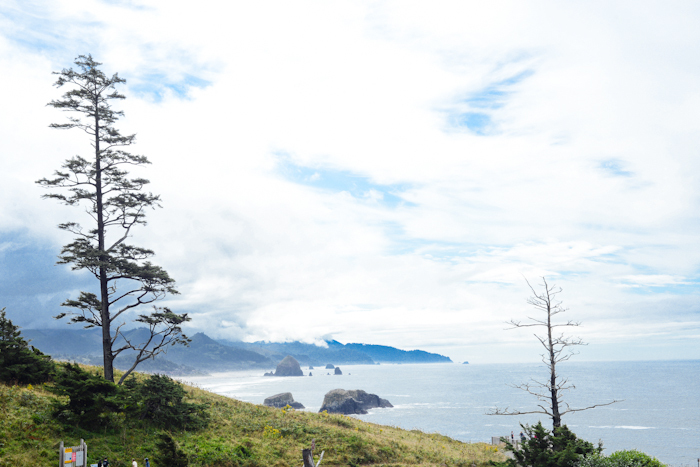 Summer Bucket List #7: The Coast!! 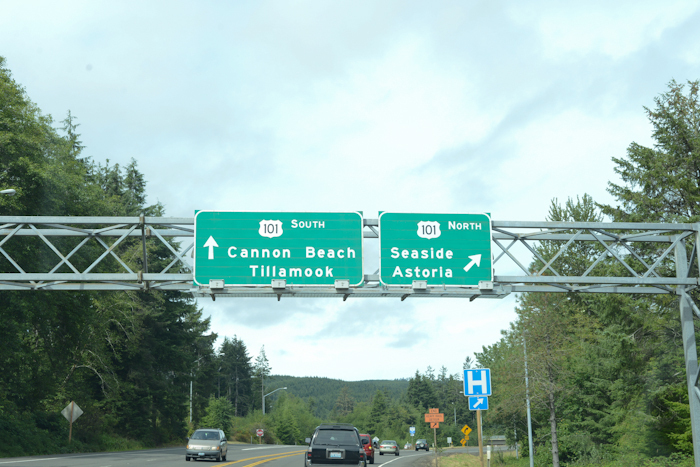 Woohoo, we finally made it to the coast! This was the outing I’ve been most looking forward to all year! 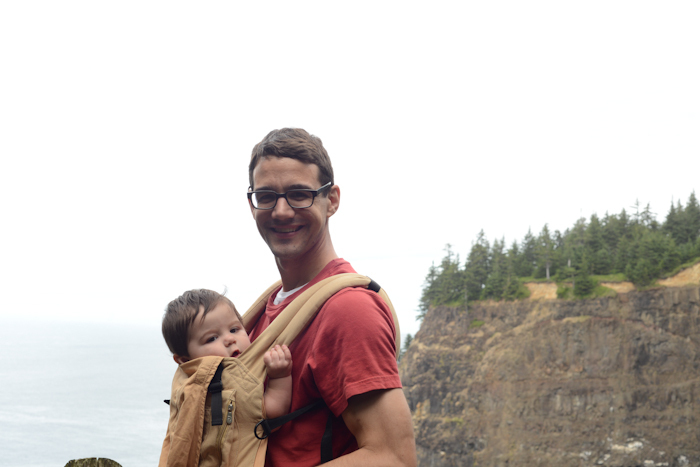 This was our first ‘real’ vacation with the babies. 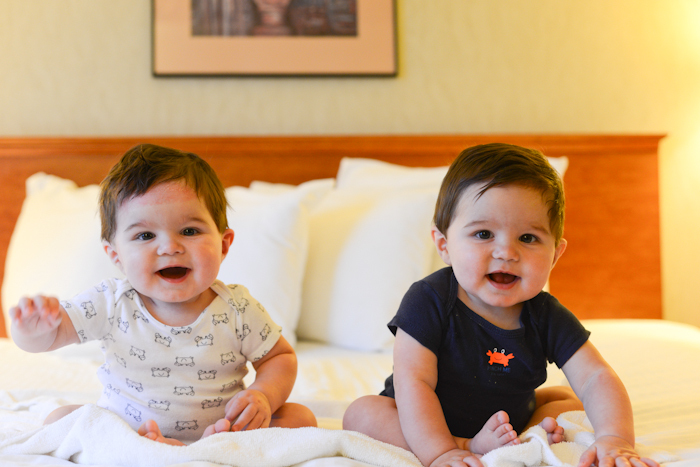 We’ve only stayed overnight at someone’s house before, but after the success earlier this summer, we were hopeful that the babies would do okay with a hotel. And the open ocean is straight ahead. We got out to stretch and to feed the babies their lunch. Happily, we’ve done a lot of al fresco ‘dining’ with them, so they were totally cool eating outside in this new environment. 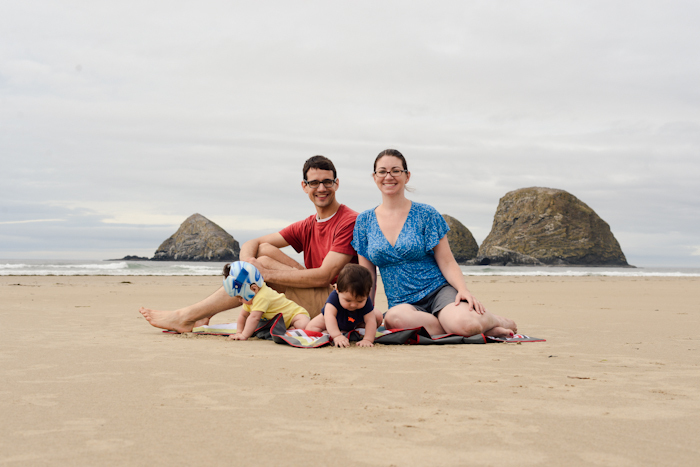 We continued into downtown Cannon Beach and found lunch for ourselves, and the babies had their bottles. Then finally it was time for the beach!! 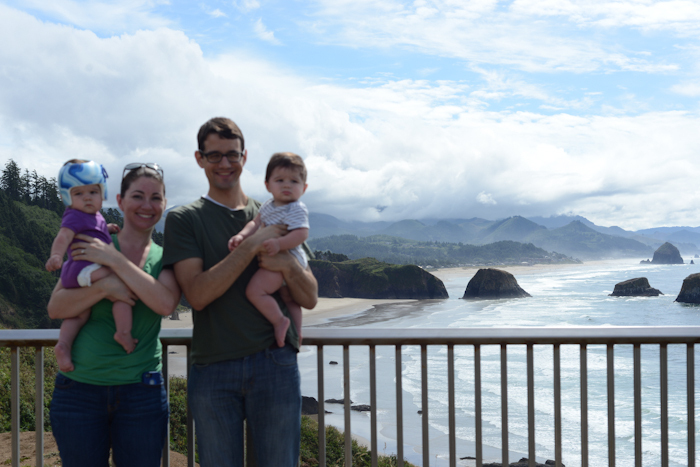 There’s the iconic Haystack Rock behind us. Again, this was a stranger…she almost hid the rock behind us and also shot vertically (I cropped it). 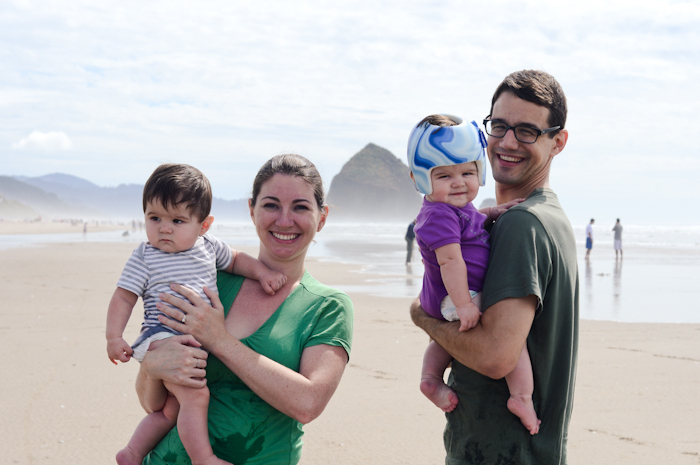 We rolled up our jeans and dipped our toes in the Pacific Ocean! The babies had been cranky but they quieted down with their little feet in the water. No doubt they were trying to figure out what kind of giant bathtub they were in and why it was so cold! Emmett even managed to kick and splash while Andy was holding him up. On the way back to dry land, one of Andy’s shoes fell out of the plastic bag I had everything in. I suppose that’s a worthy sacrifice for an adventure. He needed new shoes anyway. He grabbed some flipflops from a gift shop and we made a detour to a mini mall so he could buy some new sneakers. 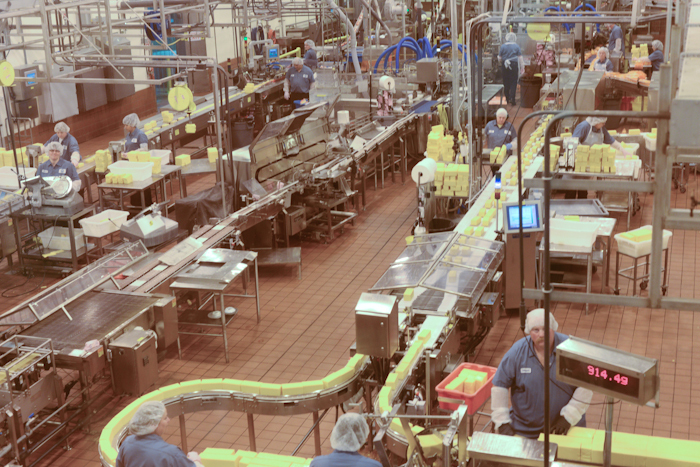 Then we continued on to our hotel in Tillamook. Babies’ first hotel stay! We had a ‘king suite’, so there was a little sitting area across a half wall. We set up the pack n plays there and crossed our fingers that the babies would be able to sleep. It took them awhile to quiet down (which happens plenty at home too), but they slept quite well. Andy and I watched stuff on our laptops with headphones. 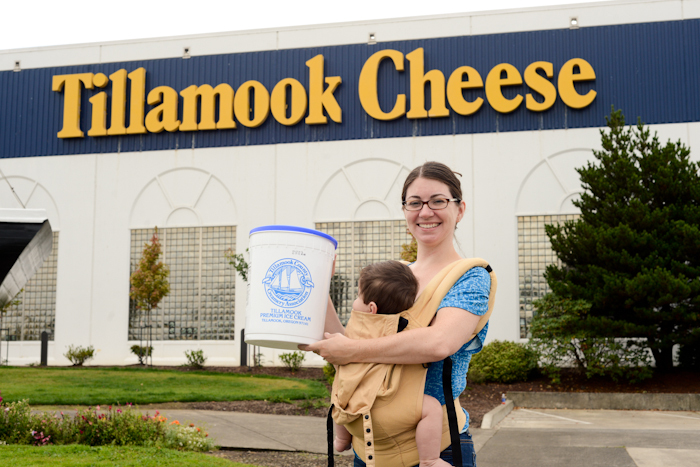 Our first stop the next morning was the Tillamook Cheese Factory. For the record, 8am is a great time to visit; hardly any tourists are out yet. 🙂 It was a quick stroll and then we got back in the car. You can buy an empty ice cream bucket for fifty cents! I was stoked. 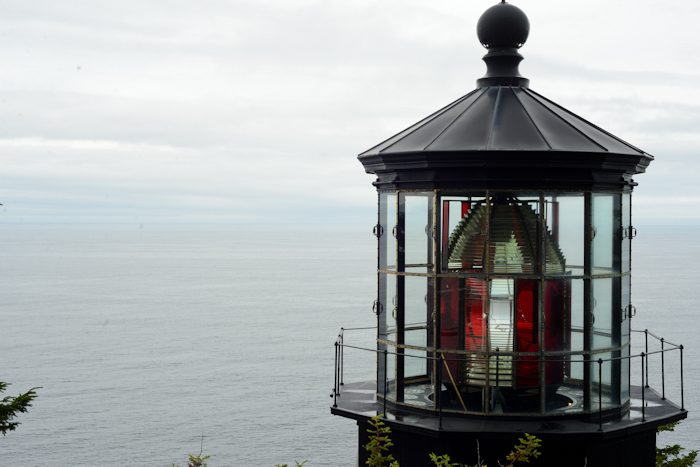 There’s a little cape to the west Tillamook, and we drove out there to see the Cape Meares lighthouse. On the way back we stopped at the beach in Oceanside, a town so small it didn’t show up on the map on my iphone. 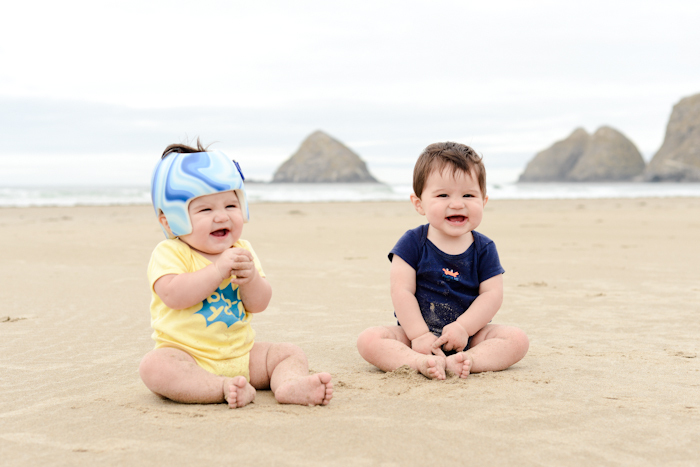 We had more time this time and so the babies got to hang out and enjoy some quality beach time. IE, playing in the sand. Yes, they definitely ate some. 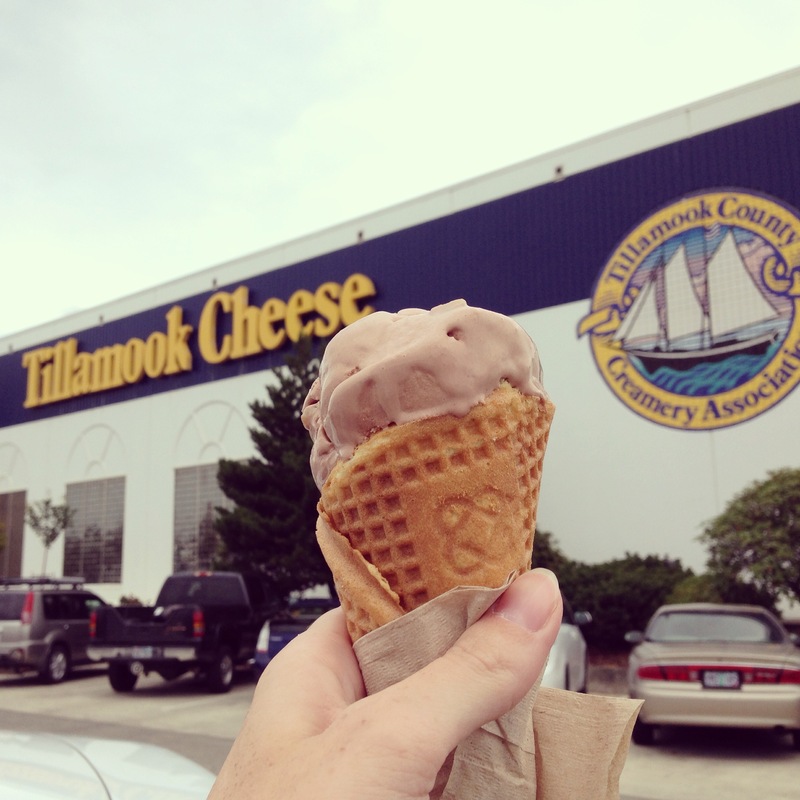 And then we went back to Tillamook for ice cream before driving home! Andy got black cherry and I got s’mores. Dee-lish. Overall, things went really well! It was a great family adventure. 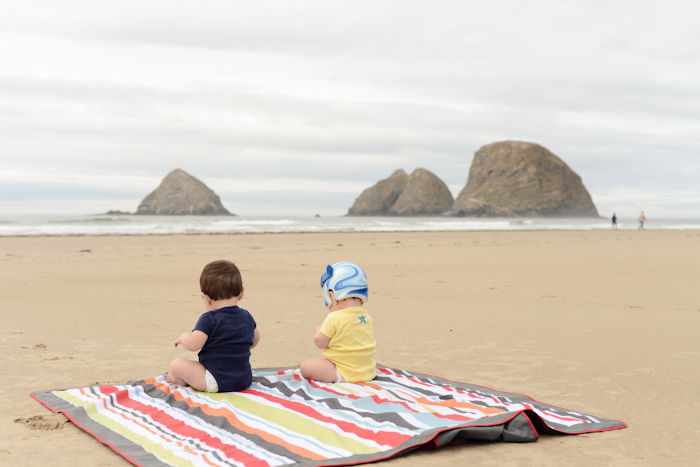 I hope we can find a closer beach-type place to bring the babies this fall, since they had so much fun. I loved seeing such pretty scenery and exploring new areas. Can’t wait for our next family vacation!